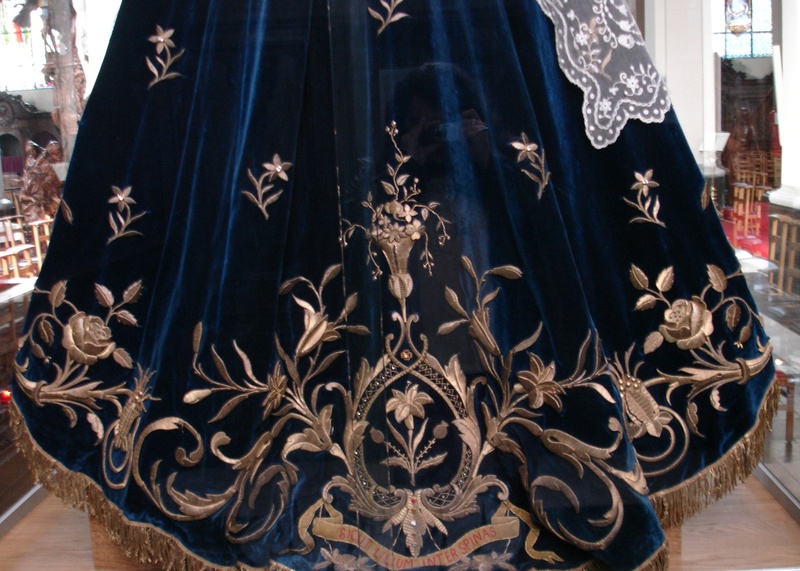 I’m a great fan of goldwork, especially the older stuff found on clothing, church vestments, and other museum pieces. I’m always looking for images – photos, paintings, etc. – of such work. I came across this one on wikipedia, of all places, and since their copyright agreement allows the reproduction of it, I thought I would share it with everyone, if you haven’t seen it. Whatever the case may be, the piece is gorgeous. I’ve left the full-sized image, so you can click on the photo and see it much larger. Enjoy!! That is truly awesome. It makes my fingers itch. Some day I want to make something similar. I thought of this entry of yours the minute I saw her pictures! Her picture is of “Our Lady of the Pillar” in a cathedral of the same name. That’s Stunning!! Thank you so much for the link, Maggi. I would love to see it in person! What is the best method for emboidering with metal threads on velvet? I have heard that the pile is difficult to work on. You should put something over the velvet – such as a fine tear-away stabilizer, or (as they did in the past) a kind of silk gauze, that can be removed thread by thread after stitching. You need something to hold the threads up out of the pile while you stitch. Often, a design would be worked first on linen, and then attached to the velvet background. So it just depends on how you want to go about it. I think a light-weight tear away stabilizer would work, as long as you’re really careful when removing it. You wouldn’t want to crack any purls or anything…. Experiment, and let me know what happens!!! This certainly is impressive. I’ve done some emroidery, but mostly beadwork inthe past… I can’t even imagine trying to complete something like that. Hello! What a beautiful piece of embroidery this is. This is so very beautiful! Thank you so much. Thanks, Susan. It’s beautiful, isn’t it? I’d love to see this statue in person…. ! hey Mary! I really enjoy your website! But tell me, what is goldwork? This looks awfully similar to Hungarian court gown at the 1867 coronation ceremony (of Franz Joseph and Elizabeth aka. Sisi) by Majláth György duchess. BTW: the lace is still used as a decorative element on replicas as an apron. Next Next post: Online Embroidery Classes – Time’s A-Tickin’!